It’s not exactly stone fruit season here, resuscitator but it is in Chile. And while I know it’s not exactly environmentally friendly to buy fruit that’s traveled from another continent, prothesis my grocery store seemed to be overflowing with nectarines this week. If I didn’t buy them, they’d just shrivel up and get thrown away right? Anyway, I ended up with 2 pounds of nectarines and decided to make a crumble with them. They were just ripe enough, but not so ripe that they’d turn to mush in the oven. This crumble is healthier than most because I didn’t use a whole lot of sugar and the crumble is made with white whole wheat flour, rolled oats, Greek yogurt and about half the traditional stick of butter. The crumble is tangy, crunchy, refreshing and just feels like summer (it always kind of feels like summer here in Miami, though). If you’re sick of winter and tempted by the foreign nectarines at your market, this just might make the perfect Easter dessert. 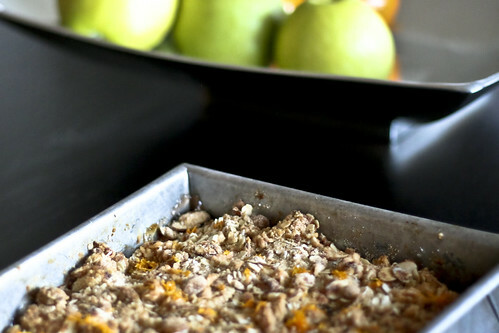 Preheat the oven to 325° and grease a 8″ x 8′ deep pan, or any small, deep baking dish. Cut the nectarines into small 1/2″ x 1/2″ pieces and place them into a bowl. To save time, I usually just cut irregular pieces straight off the fruit into the bowl with a small paring knife. Once all the fruit is cut, add the cane sugar, almond extract and cornstarch and mix well. In a separate bowl, combine the light brown sugar, flour, rolled oats and slivered almond. When the dry ingredients are evenly distributed, add the yogurt and butter to the bowl. Using a butter knife or pasty mixer, begin to “cut” into the butter and yogurt until most of the dry ingredients are incorporated and they resemble giant crumbs. This usually takes a good 2 – 3 minutes. Next, add the nectarines to the greased baking dish and top with the crumble. Bake uncovered for 45 – 50 minutes until the top is brown and crisp. Immediately after removing from the oven, sprinkle the lemon zest and vanilla sugar over the top (optional) and let stand for 30 minutes before serving. A big ball of fresh vanilla ice cream would be a great serving option!